After coming back from Japan, I actually stop taking any Japanese food, fear that the Japanese food in Malaysia will disappoint me. However, after trying out this place, the craving is back again, the taste of the food is quite similar to the taste in Japan. 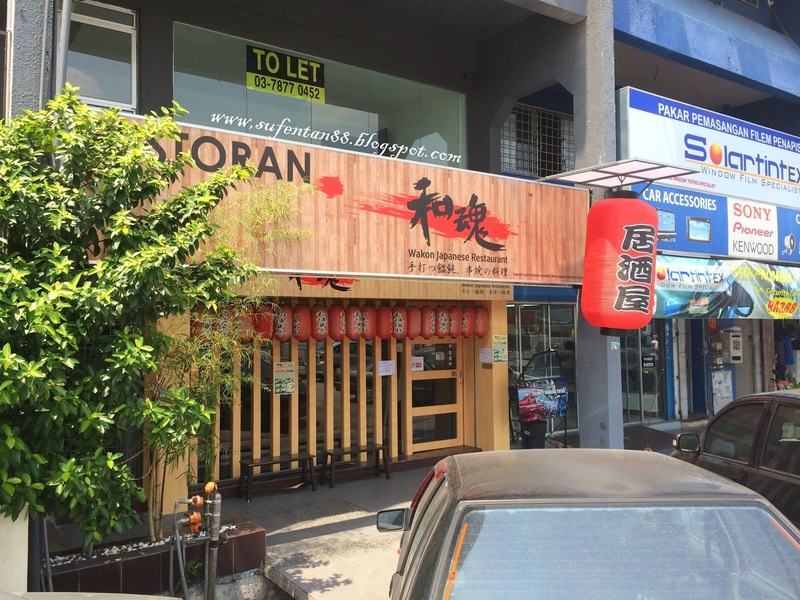 Today,I will share about a restaurant with good Japanese food here and it is located in Damansara Uptown, same row as Fat Spoon. The interior is simple and comfortable with Japanese styling. The setting very similar to some restaurants in Japan. 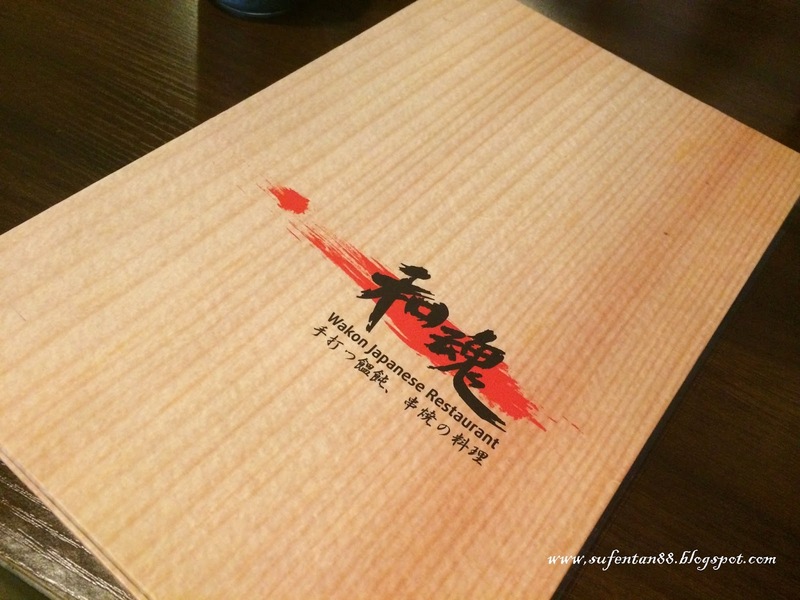 This restaurant specialises on grilled food which are served like side dishes, and they go well with their range of sake/alcohol beverage. 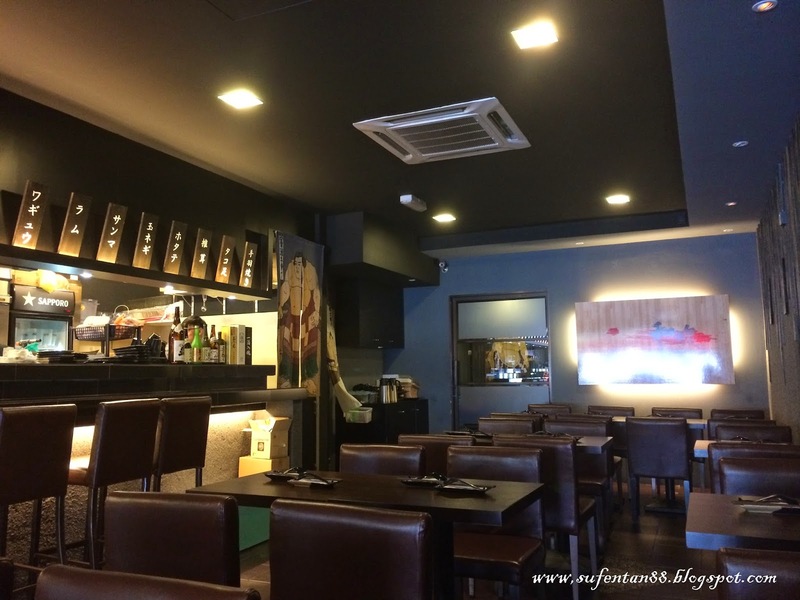 Their concept is very similar to the Japanese bar/pub with the same kind of dishes, except that the setting of the interior is skewed towards proper dining which I find it to be quite contradicting. The main menu is very unique compared to other Japanese restaurants in Malaysia, only ala carte items are displayed, you won't find any set menu or bento from here. Some may find it difficult to order as we, Malaysians are too used to the Japanese bento or set meals. You can however find set meals during weekdays on a separate menu, starting from RM9.90 that comes with soup and a drink. However, if you come on weekends, you will have to order ala carte dishes. We ordered their Salmon salad and it came out to be quite delicious. The Salmon slices are really fresh and the dish is mainly a combination of cucumber, crab meat and salmon... simply irresistible! 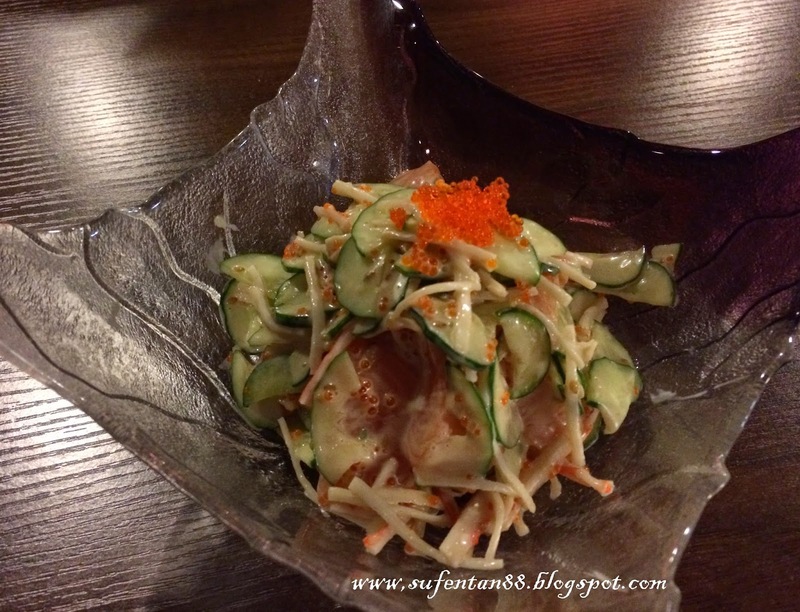 On a separate occasion, we also tried out their crab roe salad that was recommended by the waitress. The taste of this salad is similar to the salmon salad above, the difference is just on the ingredients used. I would recommend you to choose either one of according to your own liking. 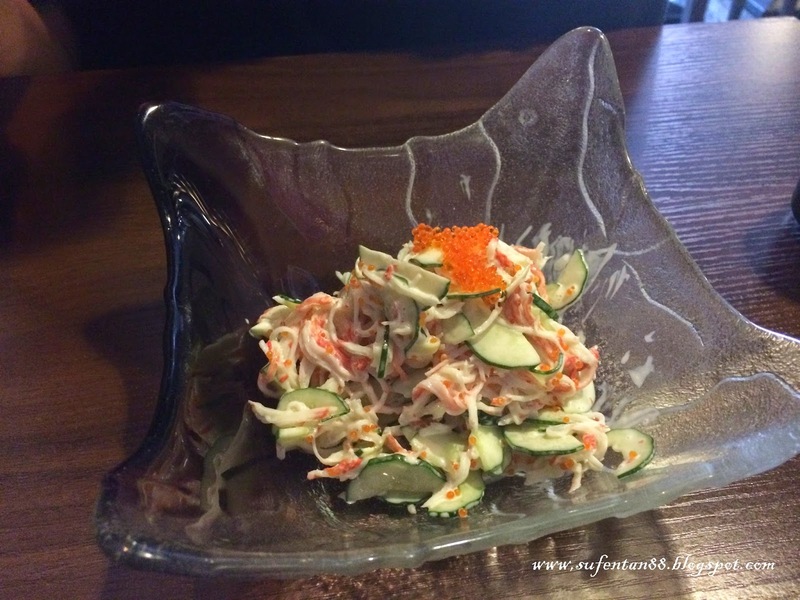 If you are a salmon lover, go with the salmon salad; and if you do not like salmon, I would recommend you to choose crab roe salad. Both tastes equally good. 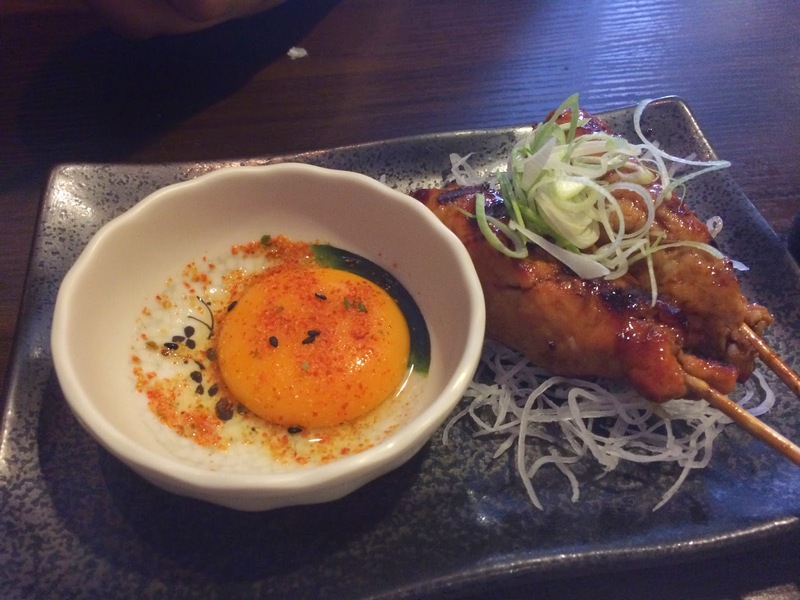 When we ordered the Salmon Belly, our first thought was to have it as a main dish for our rice. But when it arrived, we realised we have ordered a salmon belly skewer instead. The portion is very small but the taste was splendid. Although it doesn't look very appetite at first glance (please forgive me for the cut out section shown in the pic, bf was too anxious to eat! ), but the texture is smooth and juicy. Must Try! Additional side dish that we ordered since most of the portions are small, I really love this minced chicken skewer, taste quite good especially when you dip with the raw egg yolk. It actually brings out the taste stronger with the presence of the yolk. Must Try! We both love this the most. So far we cant find any other restaurant that can serve this dish any better than here. 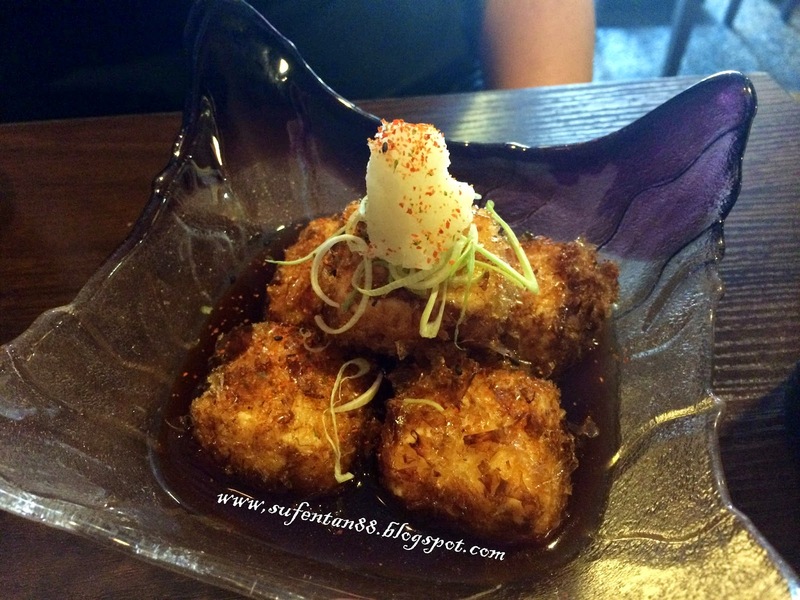 It not only looks different from the standard Agedashi Tofu, but also tastes better. The batter is crispy and it is attached to the tofu firmly; you won't have the problem of the tofu falling apart after the first bite. Of course, the tofu still remain smooth and juicy even after deep frying. The price is a bit on the higher side but it really is worth the price. Super Must Try! 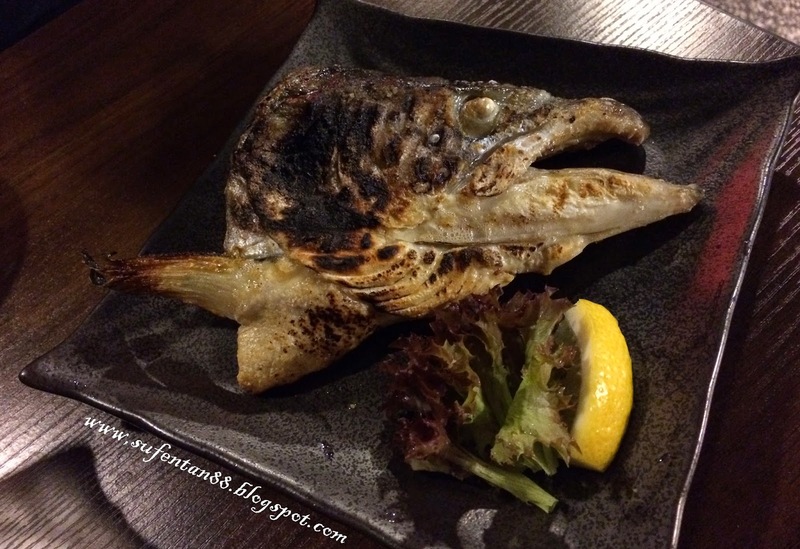 We both love this Salmon Fish Head, the taste is very similar to the Saba fish below except that the Salmon fish texture is smoother. It is always best to go with a bowl of Japanese rice. 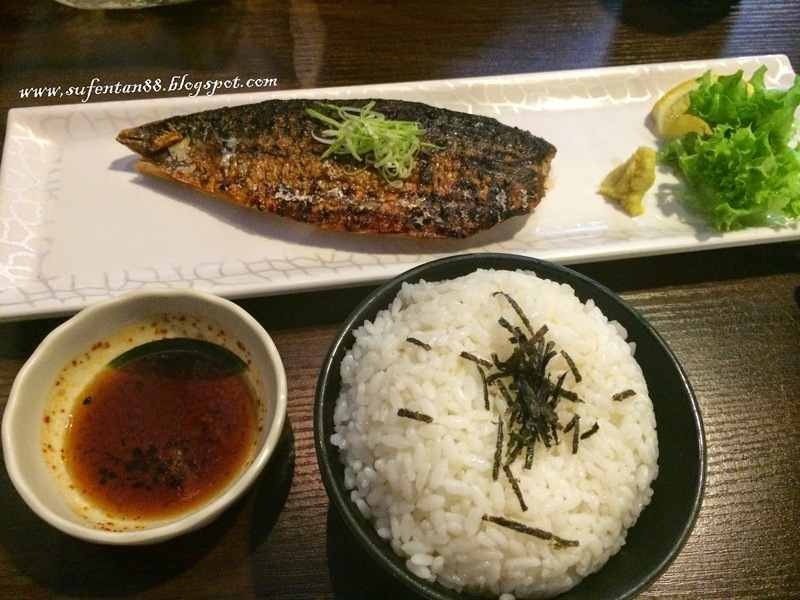 I love this Saba fish, although it is a bit salty but when you eat it with rice, it blends quite well. 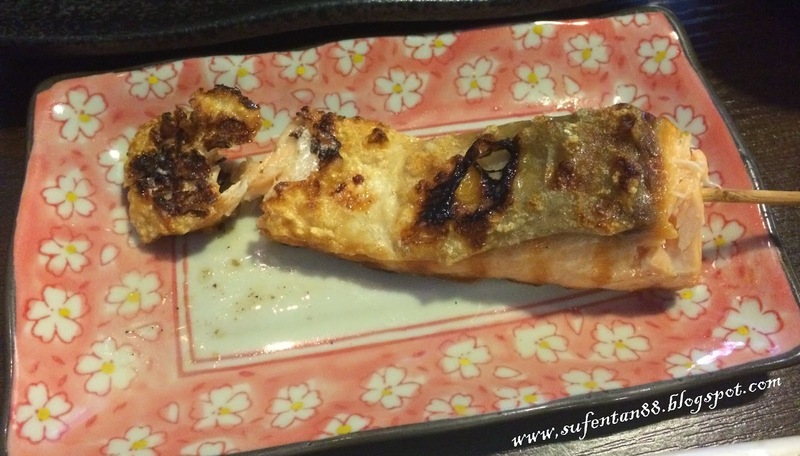 They barbeque the Saba very well where the outer skin is crispy but the meat is juicy inside. However, if you compare it to the Salmon Fish head, the texture is slightly rougher. I recommend to order either one of it not both, and save the other portion for other dishes. If you come over during weekdays, they have set lunch for this dish with drink, soup, and rice which costs only RM16.90, quite a reasonable price. I have been to this place many times before I decided to write a review about it. I think good food should always be shared and enjoyed by everyone. However, one serious comment that I would like to give to them is: never ever substitute Japanese rice with other normal rice even it is out of stock. I would prefer that the outlet pre-inform the customers about it. I am quite disappointed with their behaviour of getting normal rice from another restaurant nearby and mixing it into the Japanese rice when they are low in stock. By the way, they charge RM5 for a bowl of rice and I'm expecting honesty from the outlet. Hopefully they will change that kind of attitude, if not they will lose their customers soon.